The future is here in the international shipping industry, or at least it could be here eventually. Recently, there is news that Rolls-Royce is developing container vessels that are operated by drones. In the logistics field, companies have been considering the use of drones for years now, but this news could escalate the drones issue to a higher level. Without question, if the ocean freight industry switched to vessels that were operated by drones, this could forever change the shipping world. Most sources suggest that the crew of an ocean ship accounts for between 40%-50% of the vessel’s operating expenses in transit. A drone ship would essentially lower or eliminate those expenses. The result of lower operating expenses could result in lower ocean freight shipping rates. That is why shippers should pay attention to this potential news. In addition to the lower operating expenses, there are numerous benefits of these drone container vessels. 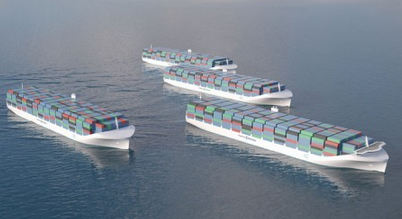 These ships would be more efficient for supply chains, and there are environmental benefits as well. A drone-operated vessel is expected to be safer for travel. Currently, the technology behind these drone vessels continues to be in the research stages. Unions of shipping crews, including the International Transport Workers’ Federation, voiced their concern over the usage of drones replacing the crew. While the industry continues to utilize new technologies like these drones, it turns out that drones cannot completely replace all positions in the industry. Freight forwarders will always be human because they provide outstanding customer service and personal care that a drone could not match.